All couples fight. Disagreement is a possibility whenever you get two people in a room. Even though you might share core values with your significant other, there is likely something that you don’t agree on. When it comes to fighting with your life partner, it’s important to do your best to fight better. It’s possible to have a successful relationship when you fight occasionally, but if you don’t want your fighting to end your relationship, you need to pay attention to the way you fight. 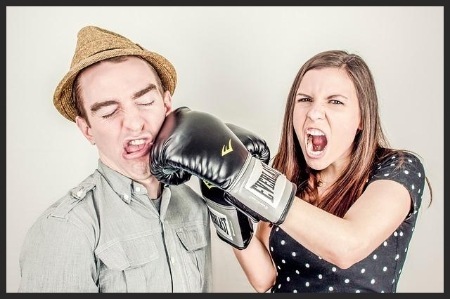 I’ve noticed, over time, that the way my husband and I handle disagreements has changed. When we first married almost 13 years ago, our fights were knock-down, drag-out affairs that involved raised voices and sometimes stomping on floors and slamming doors. Luckily for us (and our relationship) we’ve matured and grown, and the way we fight is completely different. In fact, it’s more about arguing our viewpoints than it is about having a “real” fight. I’m an emotion hoarder. When something bugs me, I tend to dwell on it, rather than address it. I can go weeks with something bugging me, with a number of other issues piling on in the meantime. Finally, a final straw appears and I snap. Usually, this final straw is something small and normally inconsequential. But because I have all this pent up emotion, it explodes out of me. While I still have issues related to emotional stuntedness and an inability to adequately express myself, I’ve made solid improvement. And this has helped my marriage. Now, if I have a problem, I express it sooner. I’m calmer about the whole thing, and rarely do things build up to the point at which I irrationally snap. This leads to much more constructive discussions overall, and a more pleasant relationship. Don’t let resentment build up. Instead, if you have a disagreement, address it as soon as possible. Try to make it happen within 72 hours. One of the keys to a better fight with your partner is to take a break. If things are getting heated, you both need to take a step back and breathe. You can set a time limit for discussing something, such as 15 minutes or 30 minutes. Sometimes, if my husband and I realize we are getting nowhere — just repeating the same things over again, or not making connections to what’s being said — we stop and gather ourselves to move forward and try to reframe the situation. In some cases, it even makes sense to go to bed angry. If you insist on staying up late to take care of something, you could be in worse shape. Poor sleep leads to poor decisions. Instead, consider breaking for the night, and then consciously getting up and tackling the issue again when you are both fresh and (hopefully) have a new perspective. Other times you might want to take a break occur when you are hungry or when those around you (like your kids) might be affected by the escalating situation. Refresh and refuel so that you are both more reasonable later. My husband and I began to see better fight results when we started really listening to each other. We make the effort to look at each other, and try to take turns expressing ourselves. The classic conflict resolution technique of using “I” language also helps. When you are both truly listening to each other, it’s easier for you both to stop yelling. If you are listening to your partner, he or she won’t feel the need to shout, and your partner is likely to return the favor and listen to you — so you won’t need to shout, either. Mutual respect is key, and you show this by listening to each other. The next step, of course, is to take the other person’s feelings seriously and do what you can to consider the other person’s point of view. Listening often leads to understanding. Even if you still disagree, listening and understanding can lead to a compromise that you are both satisfied with. It’s also a good idea to remember why you love each other. What are your shared goals? What are you both working toward? A better fight isn’t about winning against your partner; it’s about coming to a resolution that will satisfy you both — and that will strengthen your marriage (or at least keep it intact). Remember that you love each other, and that, even with disagreements, you are both working toward the same goal, and that will help you have a better fight. Finally, you need to be willing to forgive your partner, and be able to ask for forgiveness. Even if you think you are in the right, it’s still a good idea to recognize how you could have handled a situation differently and apologize for your missteps. You also need to be willing to forgive and move on. Bringing up past offenses or fights is a big no-no, since all it does is bring resentment, and it isn’t very constructive. Your life will be much better — and so will your relationship — if you can let go and forgive. Holding a grudge can impact your mental health, and it makes you miserable. The last thing you want in your marriage is to hold a grudge in a way that makes you miserable. Say sorry, forgive, and move forward. You’ll be happier, and your relationship will be better. ← When Do You Need to Say No?